A UVic-based research team has devised a non-invasive technique that only needs one drop of dried blood to measure for more than 25 disease biomarkers at a time. The technology is poised to revolutionize standard blood tests by measuring protein markers for everything from diabetes to prostate cancer, with a single pin prick. "This is potentially a far more efficient and economical method for the health care system, and has the added benefit of being less invasive for the patient," said retired University of Victoria biochemist Terry Pearson, who spent 13 years developing the technology that involves a mass spectrometer. Blood is collected with a tiny prick and a piece of filter paper. 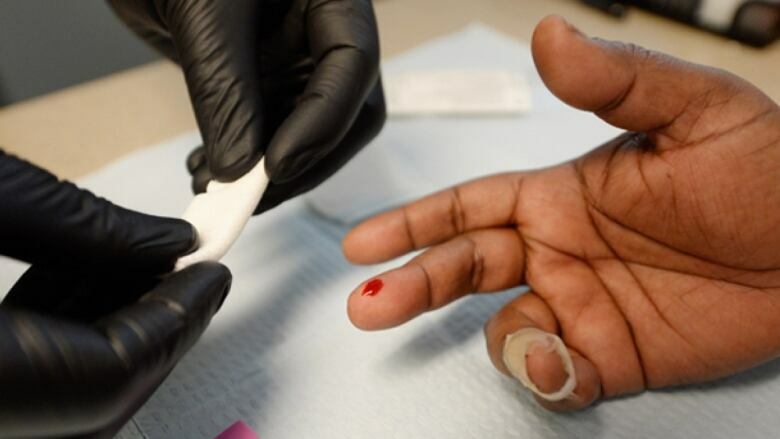 The patient can do this at home saving samples overtime, with no need to visit a phlebotomist — the person trained to draw blood. Once submitted to a lab, a scientist can monitor baseline levels of protein biomarkers for anything from cancer to cardiovascular disease or diabetes. The new diagnostic tool has far-reaching potential and should be available in Canada for widespread use within a few years, Pearson told CBC's The Early Edition. "The technology works, we have got it really polished," said Pearson. "The idea is to replace the old system, but there is a lot of inertia in the old system. It is like Tesla!" Pearson joked. Right now the core technology is used in research labs, including the Mayo Clinic and ARUP Labs in the U.S. The technology was also used by Brazilian elite athletes during the 2015 Pan American Games to monitor a large set of biomarkers associated with training, stress and performance. Pearson said it will also be usd to monitor how diet changes affect overall health and for athletes during the 2016 Summer Olympics.